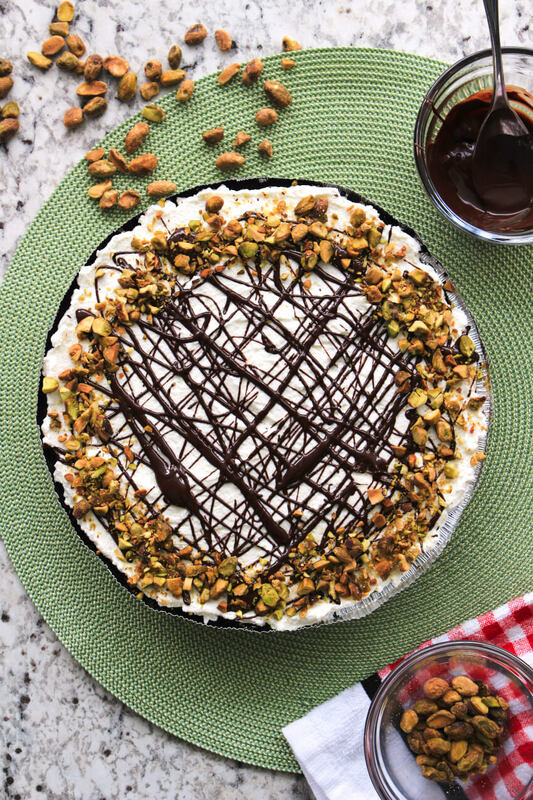 This Pistachio Pudding Pie is a no-bake dessert with an Oreo cookie crust, a creamy pistachio filling, fresh whipped cream, and a pretty chocolate drizzle. It is perfect for parties and picnics! 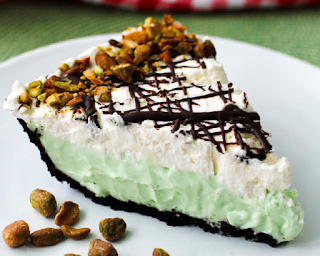 I had never heard of pistachio pie until I met my husband. On one of the first Thanksgivings my husband and I hosted, my mother-in-law mentioned that she could bring a pistachio pie for dessert. That was a new one for me so, naturally, I agreed that she should definitely bring it. I had to see what it was all about! Turns out, pistachio pie was not what I was expecting at all! I'm not quite sure what I was expecting, but it wasn't what she brought! 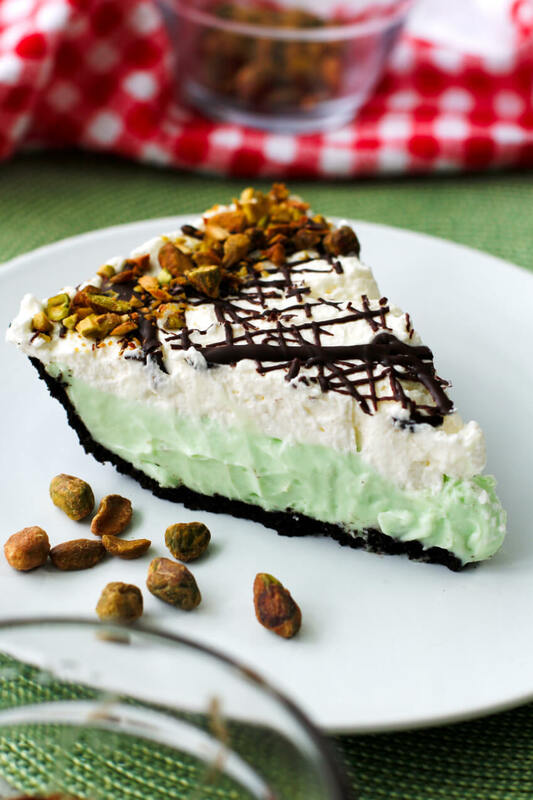 I learned that pistachio pie isn't a baked pie filled with pistachios, but a cool, creamy, no-bake pie filled with pistachio pudding. FUN! I was inspired by my mother-in-law and decided to put my own spin on a pistachio pie. I kept the Oreo crust that she always uses, and topped it with an extra creamy pistachio pudding layer. My mother-in-law tops her pie with cool whip, but I opted for fresh whipped cream and a chocolate drizzle. I topped the whole thing off with some chopped pistachios. The end result is pretty as a picture! Totally holiday-worthy and kid-friendly, too! You could omit the drizzled chocolate and chopped pistachios if you really wanted to, but why would you? The extra few minutes it takes to add them to the pie are so worth it, don't you think? In full disclosure, there is one thing about this pie that's not so pretty...the first slice. I find that no matter what I do, the first slice always comes out looking like a mess. Consider it the sacrificial slice, so to speak. One that first slice is out of the pie, the rest should cut beautifully! I also think it's important to stress the fact that this pie is SO easy to make. 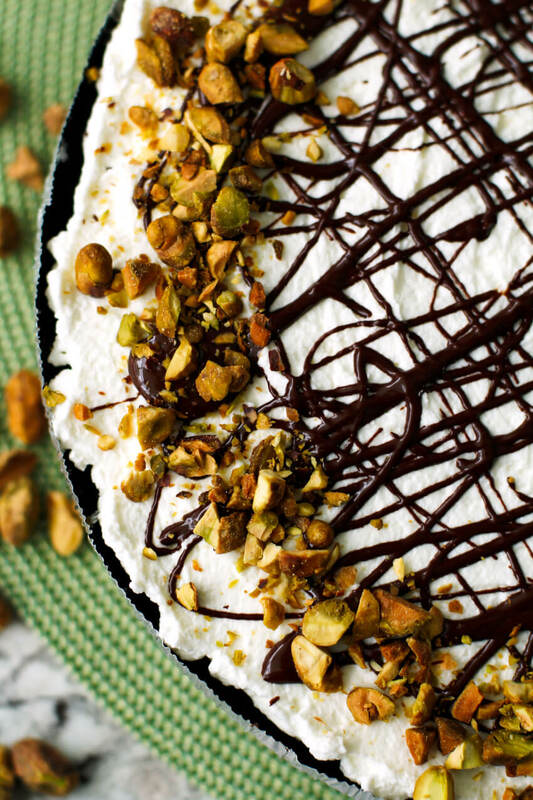 Chances are, you'll make this pie for some sort of party or event. Let me tell you, no-bake desserts can be a lifesaver when you're entertaining. You simply assemble and refrigerate! 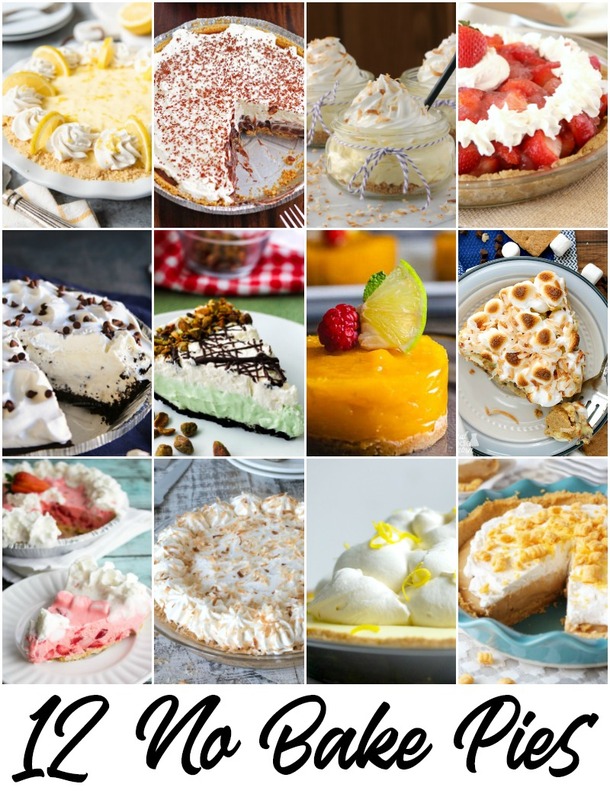 Here are more no-bake goodies from some of my foodie friends. 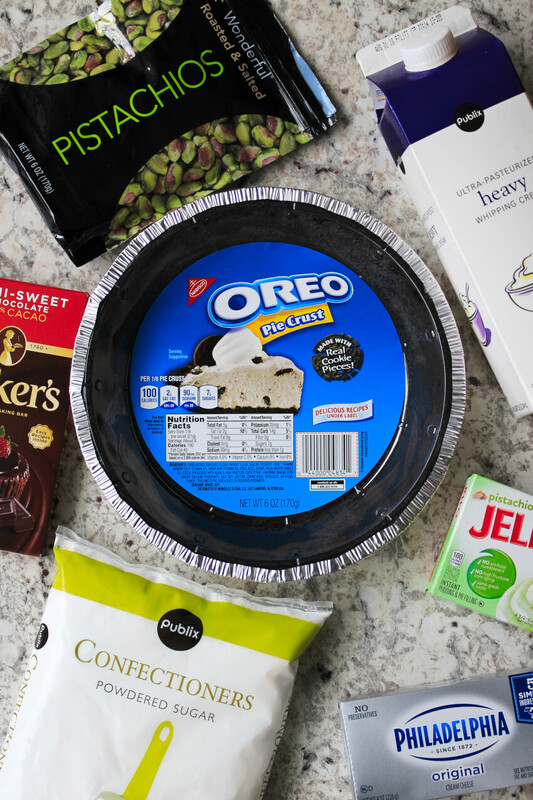 There's a no-bake dessert for any occasion! Check it out! If you love foodie videos, here's a fun little 1-minute video tutorial for you to check out! 1. In a mixing bowl, combine the pudding mix, milk, cream cheese, and 1/2 cup of the whipping cream. Spoon into the pie crust. 2. Beat together the remaining heavy cream and powdered sugar. Spread onto the pie. 3. Melt chocolate in the microwave for 1 minute, stirring after 30 seconds. Drizzle the melted chocolate over the top of the pie. Garnish with chopped pistachios. Refrigerate for at least 2 hours before serving. 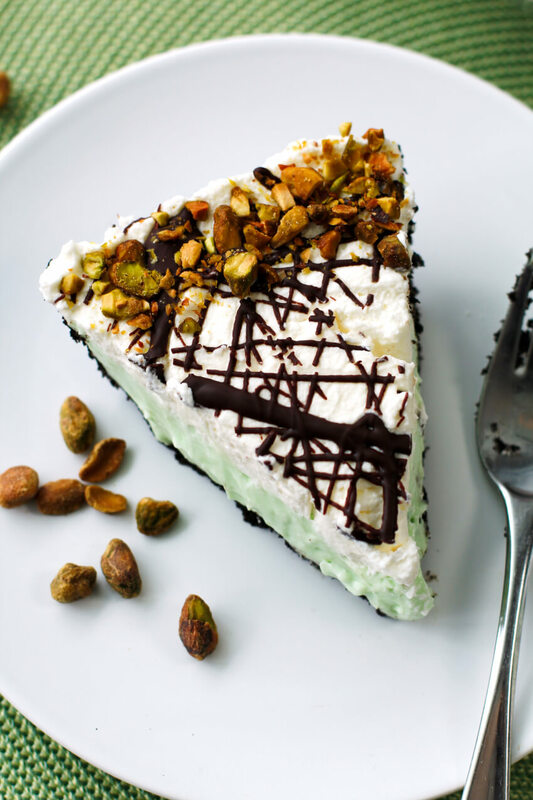 I used roasted salted pistachios for the topping, but you can use any pistachios you like. I would have never thought to put oreos, chooclate, and pistachios together but it looks amazing! !